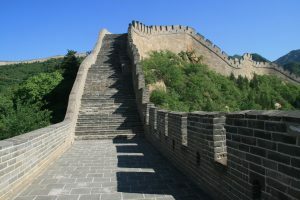 Badaling is the most famous, most crowded, and most restored section of the Great Wall. 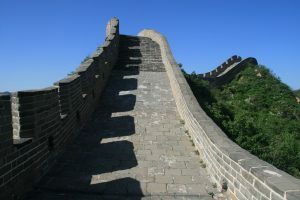 As they discussed in the podcast, Nick and Wendy were lucky to go on a rare blue sky day, and because they took a wrong turn after buying their tickets, they ended up on a section of the Great Wall completely by themselves. The light, the lack of people, and the shadows of the crenellations all helped create some beautiful photos. 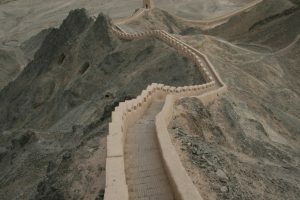 This is a wild, crumbling and beautiful section of the Great Wall where you can hike along the Wall for several hours. The Wall at this section is unrestored and in some places it is virtually falling apart. This creates quite a contrast with the pristine section at Badaling. 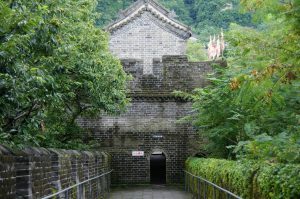 Dandong is the eastern-most section of the Great Wall of China. 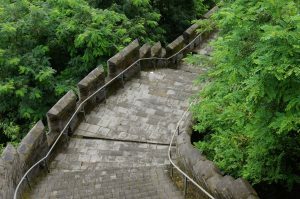 In the photos below you can see the lush green surroundings of this section of the Great Wall, as well as a village across the border in North Korea that you can see through gaps in the crenellations. 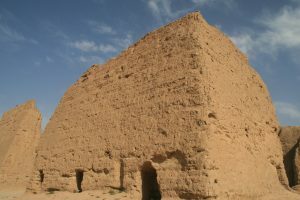 The fort at Jiayuguan is the western-most point of the Great Wall of China. 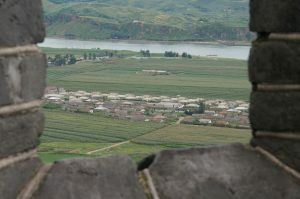 The scenery at this part of the Wall could hardly by any different from Dandong. 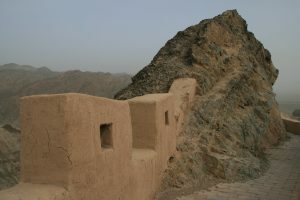 Here, thousands of kilometres away, the land is rocky and barren, and rocks themselves form part of the fortifications. 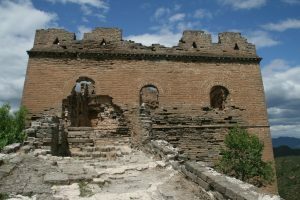 The first time we saw the Great Wall of China was at this section at Desheng Bao, near Datong in Shanxi province, west of Beijing. Here the wall is made of earth and is nowhere near as spectacular and sophisticated as it is elsewhere. 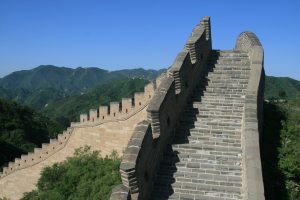 But it’s a great example of how different the Great Wall can be depending on where you see it. That’s the end of this photo tour of the Great Wall of China! 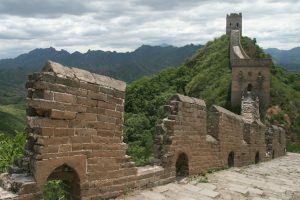 If you haven’t done so already, make sure you listen to the two-part episode about the Great Wall. And please subscribe to the podcast on iTunes, Stitcher or Android to listen to more episodes!